We are entering the golden age for eCommerce start-ups in India, especially after the Govt. of India’s new draft policy. But it’s easier said than done, and start-ups must follow a set of guidelines in order to thrive in the marketplace and compete with the likes of Amazon and Flipkart. It’s a little known fact that at least 90% eCommerce start-ups in India fail to blossom due to lack of planning, knowledge and market understanding. And this, despite India being the world’s largest consumer base. While India remains an attractive marketplace for global eCommerce chains, the domestic start-ups continue to struggle owing to unskilled and unprofessional practices. 1) Simple business model, core values: Firstly, it is very important that a start-up has a clear and simple core business idea and be equally modest in its execution. The business should intend to cater to people’s everyday shopping needs rather than trying to sell them services or products that are wants, and not needs. 2) User friendly technology, customer service: Owing to rapid globalisation and the impact of internet, Indian customers are now expecting professionalism and flawless deliverables. This is why it’s vital for a start-up to offer user friendly technology and customer service, in an effort to match up to the standards of eCommerce giants. It’s also important to personalise communication with a customer. 3) Plan investment to 12-18 months: The start-up must set aside a timeframe of 12-18 months as project flourishing time, besides keeping investment ready for a minimum of 24 months. Typically, start-ups expect immediate returns from their businesses, which is not the ideal approach. Industry experts believe any retain business requires a minimum of 2-3 years before generating significant revenue. 4) Right Product, complete catalogue: It’s very important to have a detailed catalogue on the website, including a quality photograph and product detail. According to a survey, a lot of websites struggle to sell a customer on a product due to lack of proper collection, product photograph or price. 5) Customer Support, even for small orders: Regardless of the density or cost of the order, the website must offer quality customer service. This is one of the primary reasons for the quick success of Amazon in India. A survey reveals that customers prefer making smaller orders while experimenting with a new eCommerce website. And therefore, the website should treat the order with equal importance. And finally, it’s strongly advisable for start-ups to seek the help of a renowned eCommerce consultant such as Chitrangana, the pioneers of the O2O business model in India. 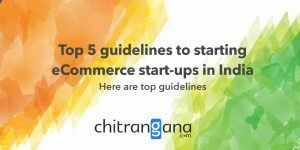 Chitrangana, which has helped a host of eCommerce start-ups find their footing in the Indian market, boasts of a dedicated team of 45+ consultants in India, UK and Singapore. The team has 10+ years of experience in multiple disciplines.